What is a silicone baking mat or Silpat? You are here: Home / "How To" Guides / What is a silicone baking mat? Silicone baking mats also known as Silpats® are a baker’s best friend and a super useful toaster oven accessory. 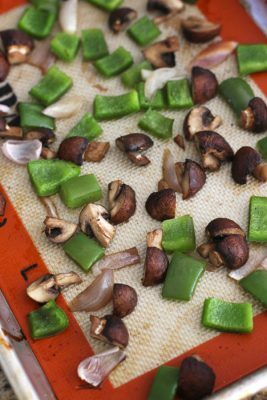 They’re great for baking cookies and roasting vegetables without the mess of added oil or the waste of parchment paper. Learn more about these convenient little mats, how to use them in your toaster oven and where to purchase them below. Note: Some of the links below are affiliate links, which means that if you choose to make a purchase through them, we will earn a commission. A silicone baking mat is a non-stick, reusable, food-safe silicone pan liner. Is that different from a Silpat®? 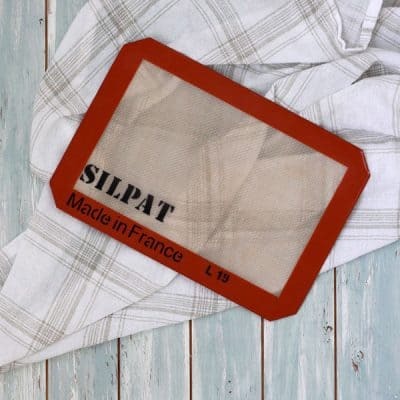 Silpat® is a brand of silicone baking mats, similar to how Kleenex® is a brand of tissues. Silpat® is our favorite brand and the brand of mats that we use for all of our toaster oven recipes. Below are links to the mats we own, they are affiliate links so we earn a commission for purchases made through them. We purchased this smaller toaster oven silpat for our old Oster and two of these silpats for quarter sheet pans for our larger Breville Countertop Oven on Amazon. What food can you cook on a silicone baking mat? 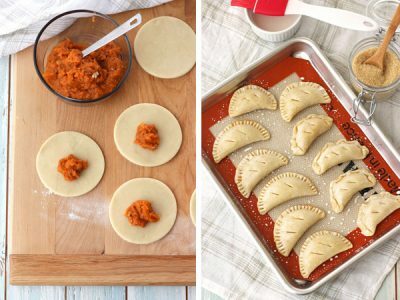 The Silpat® mats we use can be put in the oven, freezer and are great for rolling out pie and biscuit doughs too! 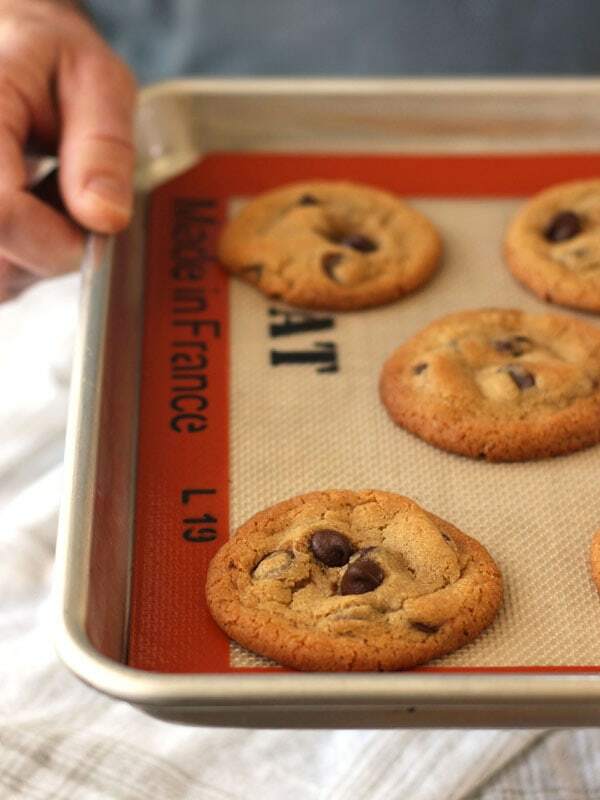 The toaster oven and quarter sheet pan mats are oven safe up to 480°F and freezer safe to -40°F. 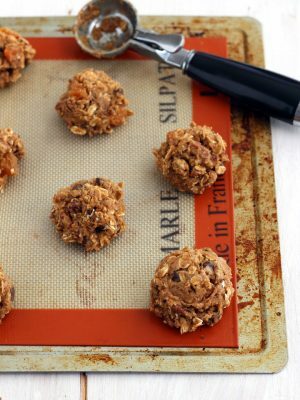 If you’ve got lots of extra cookie dough leftover from your favorite “Big Oven” recipe, you can roll the dough into balls and place them on a baking sheet lined with a mat in the freezer. Once frozen, the dough balls will be easy to remove and bag for baking later. How do you use a silicone baking mat in a toaster oven? Place the toaster oven-sized silicone baking mat on your baking sheet before adding your food items and cooking as the recipe directs. The non-stick surface eliminates the need to grease your pan or use parchment paper (which you don’t want to put in a toaster oven anyway). After use, rinse the mat clean with warm water and air-dry. If needed, you can wash the mat with mild dish soap but make sure to rinse it thoroughly. Using silicone baking mats over the years, we’ve found they do absorb strong savory flavors. So that our cookies don’t end up tasting like onions, we own 2 mats. One we use for savory dishes like roasted vegetables for toaster oven calzones and the other is for sweets like these double chocolate cookies. Are there things you shouldn’t do with a silicone baking mat? Don’t use knives or other sharp objects on the baking mat. Also, don’t cut it. Tempting as it might be, do not try to cut a larger mat to fit your toaster oven pan. Most silicone baking mats have a fiberglass mesh sandwiched between the layers of silicone. Cutting the mats could cause the fiberglass to get into your food. Don’t use the mat when broiling food or place a baking mat directly on a heat source like your stove top or a hot plate. Where can you buy toaster oven silicone baking mats? We’ve always purchased our mats on Amazon but I’ve seen them available online at Bed, Bath and Beyond, Sur La Table, Williams Sonoma, and Target. For your convenience, below are Amazon links to the mats we own. Please note, they are affiliate links so we earn a commission for purchases made through them. This smaller toaster oven silpat measures 7-7/8-inch x 10-7/8-inch and is made for use with an 8-inch x 11-inch pan. If you have a larger toaster oven, like our Breville Smart Oven Pro that can accommodate a quarter sheet pan, you might like these silicone baking mats. They measure 8-1/4″ x 11-3/4″ and fit nicely in a rimmed Nordicware quarter sheet pan. There are a variety of different silicone baking mats online, these are just the ones we use and like. Many silicone baking mats are too large for some toaster ovens and the cookie sheets in most toaster oven pan sets. Make sure to measure the area of your toaster oven baking pan before shopping to ensure any mat you get will fit. I own a Breville Toaster oven that has a square 11 x 11 pan. I can’t find a silpat to fit it. I have a smaller one that only covers part of the pan. Any ideas where I can find one to fit my oven pan? I haven’t seen a square mat before but there is an octagon shaped one. Obviously, it would not be a perfect fit but it might give you more surface area to work with. BBB has the mat’s measurements listed as 10.5″ L x 10.7″ W, you can see it here. I love coming to your site to find “things” and “how to’s” for my recently purchased toaster oven. Silpat quarter sheet mats are on the way..
Off to read the 5 tips for baking cookies now..
Ross, I’m so glad to hear you’re enjoying the site and having such a good time with your new toaster oven! What about other silicone bakeware, like muffin cups? Are those toaster-oven safe? I’d think so but I’ve reached out to a lot of companies and NONE have responded that their products are toaster oven-safe. They usually say either their bakeware works best in an oven or that they haven’t tested the bakeware in a toaster oven. Hi James, my mother has the Breville Air and I know on the standard settings she uses a silpat to line her baking pan without a problem. I’m not sure if it can be used with the air fryer setting or the air fryer basket though. I’d check with Breville’s customer service on that. If you’re in the US their number is (866) 273-8455. Also, if you’re on Facebook there are two great groups dedicated to that specific oven you might want to check out. Thank you for this guide! I just bought a toaster oven and am still trying to find the best way to use it. So glad I came across your blog before trying to put parchment paper in there! Yesica, I’m so glad you found it helpful. Congratulations on your new toaster oven!